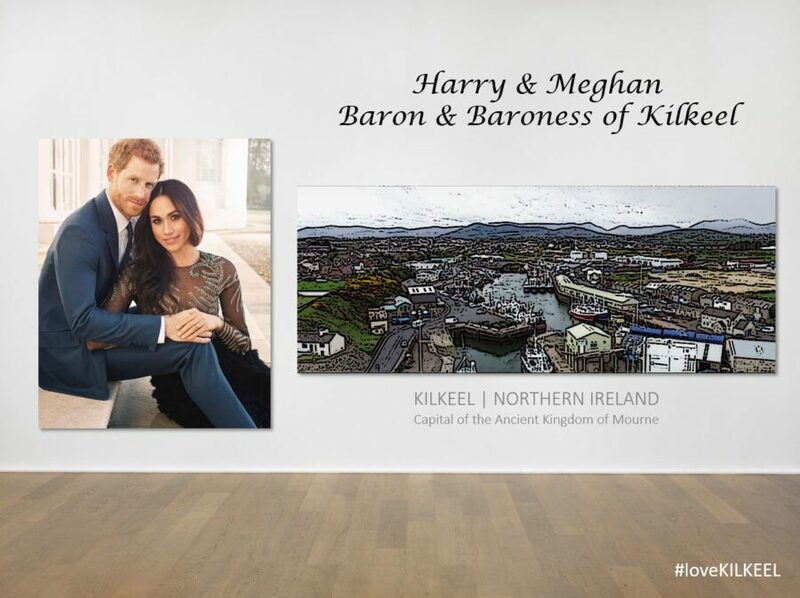 Welcome to Harry & Meghan – Baron & Baroness of Kilkeel! We are absolutely delighted to hear the news, putting our wee town on the world map! First up – where is Kilkeel?!?!? So, what’s the craic in Kilkeel? Kilkeel comes from the Irish Cill Chaoil, meaning “church of the narrow”, a 14th century church, the ruins of which remain today. Locally we’re recognised as the Seafood Capital of Northern Ireland, our harbour bringing in ~60% of NI’s fishing catch. We’re known around the world for our Dublin Bay Prawns (huge tasty langoustine, relatives of the lobster family) and our King Scallops – wild caught from the deep cold waters of the Irish Sea – world class seafood that we’re proud to call our own! Originally we were a farming community. Over the centuries our locals moved down towards the sea and, using their farming skills, a small economy of seaweed farmers popped up. But it was when the harbour was built in the 1850’s that the fishing industry was finally able to land its catch and the fishing industry was born. The folks of Kilkeel are genuine, hard working, real salt of the Earth folks. We’d like to think this is why Kilkeel has been chosen for Harry & Meghan. Here’s a lovely short vid that shows our people and our place. We #loveMOURNE and feel that we are the lucky current custodians of a space designated as an Area of Oustanding Natural Beauty. For Harry and Meghan it offers isolation, peace and tranquillity when they need to escape from the pressures of the world, or as an adventure sports mecca they can let off steam with a range of adrenaline sports that will get them wet, take them high or get their hearts racing! The Mourne Mountains are the highest points in Northern Ireland. The Kingdom of Mourne is the ancient name for the region that surrounds the mountains. Unofficially Kilkeel is the Capital of the Ancient Kingdom of the Mournes, the place the mountains meet the sea, where, for thousands of years traders, philosophers and travellers have embarked and disembarked boats onto the Island of Ireland. 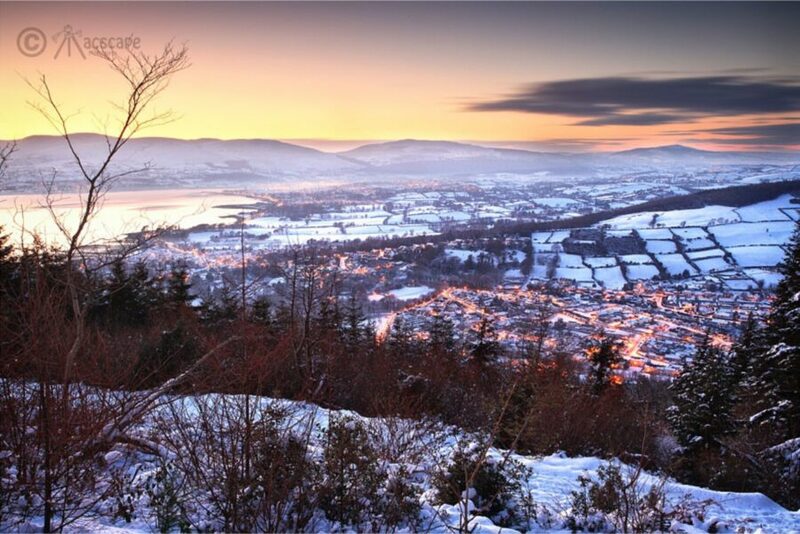 This photo captured by local photographer Sean Macaleenan just before Christmas was taken on the spot where CS Lewis sat overlooking the Mourne mountains. He looked up, saw that view and came up with Narnia. Should Meghan and Harry have children one day and they read the Chronicles of Narnia they came come to Kilkeel and see them for themselves. Magical Mourne! Since November the social enterprise project MADE in Mourne [www.madeinmourne.com], based in Kilkeel, has lead the way locally as a positive ‘can do’ hub focused on empowering women. >90% set up and run by females under 35 [when we launched I was 8 months pregnant! ], we’re empowering young women to launch business to develop a generation of Mum’trepreneurs who can create businesses that will generate long term, sustainable jobs for our children. We’re not shying away from the fact that it’s really difficult to run businesses from Kilkeel as we’re pretty remote and off the beaten track. But if we can do it here, we can do it anywhere right! Locally we’ve been inspired by strong powerful women like Meghan, so to have her connection to our wee place is a great inspiration to our young women coming through. Our MADE in Mourne strategy (as mum’s): “Any kid from Kilkeel with talent and ambition can make it big!”. Simple as that. Northern Ireland is tiny, pretty much 2 hours drive anywhere. Kilkeel is just over an hour from Belfast, an hour and a half from both our airports. We’re also just over an hour from Dublin. If you’re coming up from Ireland, take the Carlingford Ferry which comes into Greencastle, a few miles from Kilkeel, across from the stunning town of Carlingford. Whilst they are here Harry and Meghan can take a trip to Carlingford, a place we’d recommend tourists visit as part of their trip to the Mournes. We often have American tourists in Kilkeel tracing their ancestral routes. The Carlingford Ferry is the scenic route in, by far the best way to experience Kilkeel as a Gateway to the Mournes. ‘Bout ya’? – How are you? ‘What’s the craic?’ – how are you? ‘Wind your neck in!’ – calm down! 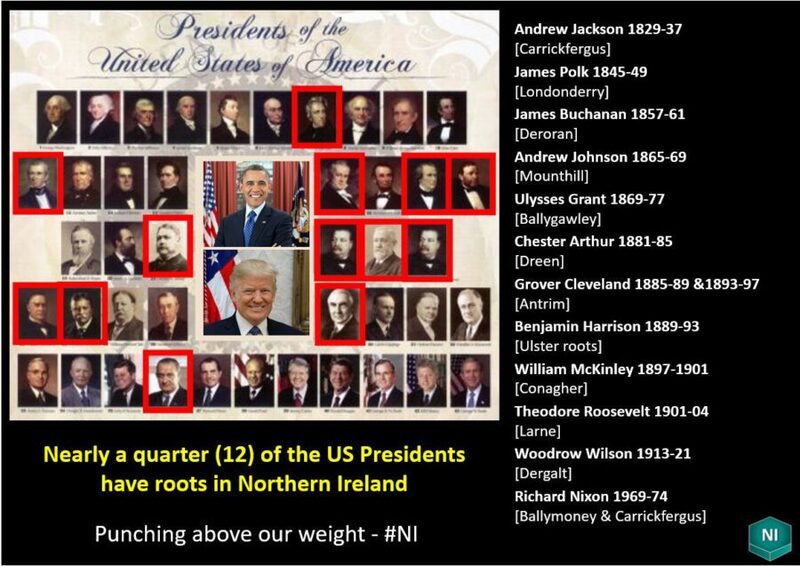 Did you know that nearly a quarter of the Presidents of America (13) have origins from Ulster? Despite having only 1.8 million people and being smaller geographically than Houston in Texas, people from our wee place punch above their weight on the world stage and in history. In 1608 Sir Thomas Phillips set up the world’s first licensed distillery. His Bushmills whiskey exists today. Over the next 400 years people from this tiny part of the planet lead and changed the world – Ferguson invented the tractor and 4WD, Lord Kelvin the Kelvin Scale, Sir Hans Sloane (of Sloane Square fame) even invented drinking chocolate – the Cadbury’s Brothers started by selling Sloane’s Drinking Chocolate. Our 1.8 million population is only 0.025% of the world’s 7 billion population, yet we punch above our weight with our world class golfers (McIlroy – from the world’s oldest Golfing Union), musicians (Van Morrison), actors (Liam Neeson, Jamie Dornan), storytellers (C.S Lewis), footballers (George Best), poets (Seamus Heaney), inventors (Pantridge’s defibrillator, ejector seat)… the list goes on and on. With the world cup coming up, did you know that the penalty spot was a local invention too…? If you’d like to find out more about Kilkeel or what’s happening in the Mourne Region – Jenna Stevenson – jenna@madeinmourne.com.